Since 1961, Amnesty International has been working to make sure that all people everywhere live in dignity with their voices heard. They will continue their efforts until no one is tortured or executed. Currently, there are 3 million supporters, members and activists in over 150 countries aiding the cause (from the web site, Amnesty International). The following is from BBC News if anyone asks "why?" Syrian President Bashar al-Assad should face trial at a UN court over the "brutal" treatment of his people, Australia's foreign minister says. Kevin Rudd said incidents such as the alleged torture and murder of a 13-year-old boy by security forces had robbed Mr Assad of any legitimacy. Syrian officials have announced an inquiry into the boy's death. Activists say more than 1,000 people have been killed and 10,000 arrested in weeks of anti-government protests. The 13-year-old boy, identified as Hamza al-Khatib, has become an icon of the uprising in Syria, says the BBC's Jim Muir. Activists say he was detained by security forces and tortured to death, while the authorities insist he was shot dead during a demonstration. Mr Rudd called it a "brutal act" and accused Mr Assad of taking "large-scale directed action" against his own people. "I believe it is high time that the Security Council now consider a formal referral of President Assad to the International Criminal Court," said Mr Rudd. US Secretary of State Hillary Clinton said the boy's death showed the regime was deaf to the voice of its people. "I can only hope that this child did not die in vain but that the Syrian government will end the brutality and begin a transition to real democracy," she said. Hamza Khatib is being hailed as a martyr, and his picture is now held aloft at demonstrations around the country and abroad. He is also being called a martyr by the Syrian authorities. The teenager's father and family were invited to meet President Assad, and they were quoted as saying they were overwhelmed by his kindness. 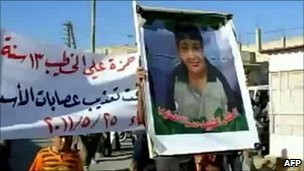 The boy went missing after a demonstration at an army barracks near Deraa in the south at the end of April. Activists say he was captured and tortured to death, and that his mutilated body was handed back to his family four weeks later. The government says he received three fatal gunshot wounds during the protest and died on the spot, but there was a delay in handing over his body because he was not identified. What's it like to be a sponsored child?